Click the play button below, or subscribe and listen through our podcast on iTunes, Stitcher, Spotify, or Google Play. I never could come up with a sufficient answer (I mean, come on, that’s only the greatest life mystery of all time), but that never stopped my continued questioning. I wanted to feel like my time, energy, and effort meant something … like I wasn’t wasting all of this time for no good reason. I needed to see the bigger picture. I was coaching a client the other day (let’s call her Maggie, shall we? ), and she started down this same familiar line of questioning. 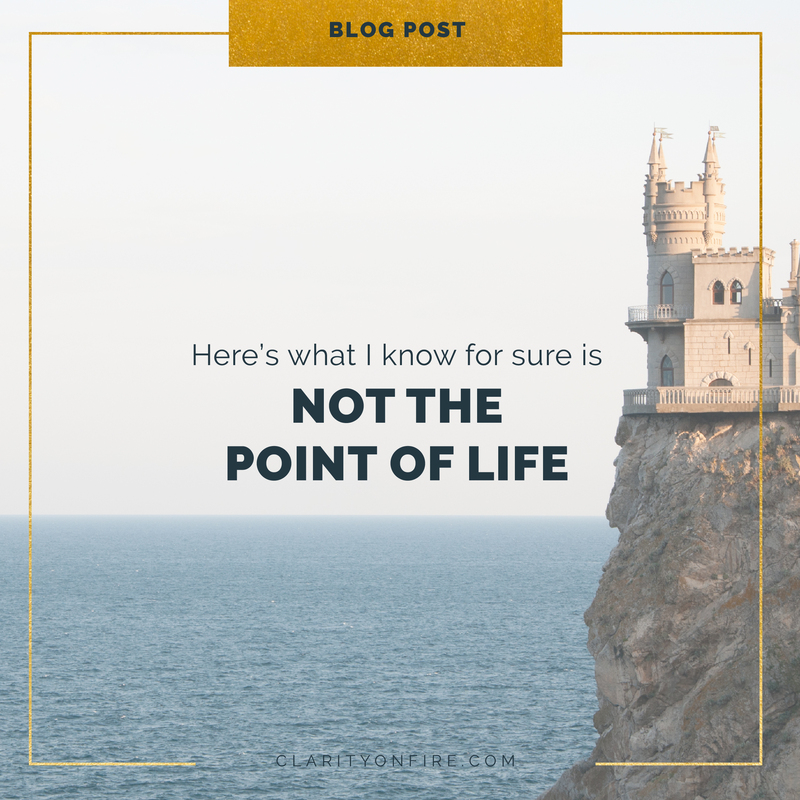 After years of going down my own rabbit hole of life-purpose questioning, I’d realized that it’s not particularly helpful to ask yourself, “What’s the point of life?” That’s a seriously loaded, inaccessible question, and it’ll stump you every time. There never has been and never will be a single definitive answer. That’s part of the magic and mystery of being human! And (this was the toughest of all for her to admit) having a career at all. For so long, she’d unconsciously believed that her career was synonymous with her life purpose, but that no longer felt true. She was having this light-bulb moment that her career might just be one way (and not even necessarily the biggest way) for her to express her life purpose. But a job itself could never be her purpose. After making her list, Maggie immediately felt a huge sense of relief. It was like she finally had permission to NOT care so much about the things she’d always thought were important … the things she assumed she was supposed to want. They were absolutely NOT the point of her life. But many of us are not necessarily living accordingly. The things on this list? These are the kinds of things we tend to get most upset about. These are the things that make us feel bad. These are the things we stress and obsess over, day-in and day-out. These things take up an enormous amount of our brain-space and daily energy. Make your own list of what’s NOT the point of your life. Then see just how much time, energy, and worry you’re devoting to them on a daily basis. Give yourself permission to let these things go. Maybe that means reprioritizing your time and energy. Perhaps that means lettings some things go permanently. Or maybe it just means no longer spending SO much time stressing and worrying about the things on this list. When you know for sure what’s NOT the point of your life, you can finally feel free. Did this resonate with you today? What’s on your list of what’s NOT the point of your life? Leave a comment to let me know! Our twice-yearly online group coaching program, the Passion Plan Virtual Experience, is open for enrollment NOW through February 6th (or when we hit 50 people, whichever comes first). It’s a 6- week course (with a mix of pre-recorded videos, workbook assignments, and live video hangouts with the two of us) that helps you figure out what to do with your life. Think of it as the “AP Life” class you should have taken in high school, but never got the chance! Early bird enrollment is going on NOW through this Friday the 1st. That means if you sign up before then, you can get the course for $369 instead of the usual $469. We’re only taking 50 people in this round, and enrollment is first-come, first-served. If you want in, you definitely don’t want to dally. Thank you for this blog Clarity on Fire. We do focus on things that are not the point of life everyday and we as a society are not making it easy either. I’m going to make my own list and just let it go. I wake up everyday with a headache because i worry about unimportant things. After reading your blog, I’m going to teach myself not to worry so much about things that are NOT point of life and just try and enjoy each day as it comes. Keep up the good work and i’m looking forward to your next blog. Bridget, you’re so right! Letting go of the everyday, unimportant stressors has become almost an act of courage and rebelliousness because it’s not the norm in our society. Constant stress, worry, and anxiety (even over minor things that are definitely NOT the point of life) has become commonplace for most people, but that absolutely does NOT need to include you! I’m happy to hear that you’re making your own list and intend to let those things go so you can refocus on what’s REALLY important. Who knows, you might become an example that could inspire someone else in your life to do the same! From some days I was not happy with my life. I was in dilemma, what is going on, why am I feeling like that? What is the actual problem with it? Now I know how to find the problem with solution. Thank you for your article. Its a good way to find the value of life. I’m glad this was helpful for you today, Jobin! Thanks for reading! Having the perfect athletic body at the age of 40…that is NOT the point of life. YES YES AND YES, ALL OF THIS!!!! Not having a 6 pack or looking as for as Jillian Michaels. It works for her, but all these things and all the things on Maggie’s list – they are being released and are NOT the point of my life!!! I so love this blog, keep up the great work Rachel & Kristin!!! Thanks for sharing your list, Lola! Figuring out what’s really true for you is definitely not an overnight thing, but it seems like you’re on the right track of questioning what matter most to you. Thanks for reading, Eric! I am 78 … Still working and still trying to find out what the point is!!!! This is absolutely something that SO many people struggle with, regardless of age or where you’re at in life! It’s worth asking yourself, “What’s NOT the point of my life” no matter what stage you’re at in your career. The answer is always revealing! Love this! Thanks for reposting. I’m constantly questioning the purpose of life and I frequently exclaim that humans are not meant to sit in a cubicle and stare at a computer all day! This, of course, is prompted out of utter frustration because it’s what I’ve been doing for years. I’ve told my boss directly that I’m not interested in climbing the corporate ladder. This may not always be well received, as perception is often reality in the workplace. It doesn’t mean that I’m lazy or lack ambition, I just hold different values. Recognize! Well, I owe it to you and Rachel! I’m a fellow PPVE-er and you’ve both been a huge inspiration. Something amazing happens when you can make even the slightest shift in perspective. I’m finally starting to honor myself, be open to opportunities, and care less about what others think. It doesn’t happen overnight, but bit by bit, I continue to grow and it’s incredibly freeing. Thanks for being awesome! One of the other commenters mentioned the misperception of people who don’t want to climb the corporate ladder as lacking ambition. I was just going to say it reminds me of the thriver profile in your passion profile quiz. That one seemed to be the one where people value other things outside of their career more than their career itself. I also like that you guys have destigmatized it by saying that it isn’t wrong for someone’s job to be “just a job” and for them to get fulfillment elsewhere. I think it took a while for me to come around to understand that. But where things get tricky is when what you do for a job (okay, I’ll say what I do for a job) isn’t sufficient to support myself financially. (I tutor kids with dyslexia, autism, ADHD). There are outside voices that say “are you really gonna let yourself be poor your whole life and dependent on having a roommate?” and “you should be trying to improve your situation” and that’s when I feel caught because it seems like “improving my situation” does become the point of life. But I guess to be clearer, it feels like that is a goal that is simultaneous with my passions that I have outside of work (like reading for pleasure, watching movies and tv (but not the mindless kind, the engaging kind that makes me think). Another thing that I’m tackling right now is overcoming an eating disorder which I’m in therapy for. I mention this in my discussion about the point of life too because I think being healthy is so important. And I’m curious to understand how the pathology came about in me and how to cross the bridge that will get me to the healthy side. When I envision my future, I imagine either overcoming that obstacle and somehow incorporating it into my life via helping others who face the same thing or just simply getting better myself and continuing to do what I do for work now but in a better physical and mental state. Overall, I think one constant thing that will always be the point of life for me is continuous learning. Taking in new ideas. That’s what makes me feel alive. Hi Marianne– Really great comparison to our “Thriver” Passion Profile! Yes, for a lot of people, their career is definitely NOT the point of their life. It’s one aspect, sure, but not the end-all, be-all. And it sounds like that’s where you fall, which is totally normal! I loved hearing your realizations about a couple of your top life values: health (physical, mental, emotional, and all of it) and continuous learning/curiosity. While none of us may know THE POINT OF LIFE, I think it’s safe to say that these things are (at least in-part) the point of YOUR life. And anything that helps support those things — whether it’s a job that allows you to live a healthy lifestyle or a passion project that lets your curiosity run wild — are things worth prioritizing in your life. Thank you so much for sharing how this post resonated with you and the deep thoughts it spurred within you! Having a horrible day and started cleaning out my email inbox and came across this blog post. Immediately, I could relate to constantly asking myself questions about life and its meaning. I often say “surely there is more to life than this”. This post helped me to realize why I never feel fulfilled at work. I haven’t found a job yet that I am actually happy to do. I never really gave it much thought because I have to pay the bills and I have someone depending on me. The truth is I can agree that deep down inside I know I can never find self-worth and divine peace in a job. I am looking for deeper fulfillment in a place I can never find it. Victoria — I’m glad this post was what you needed to hear today, based on how you’ve been feeling! And you’re right that self-worth and divine peace aren’t things that can come from any external place (a job, or anything else). They’re an inside job. Seems to me like you have a lot of self-awareness already, and you’re well on your way to building that deeper fulfillment, even if it’s a slower process than you might like. You’re on the right track!